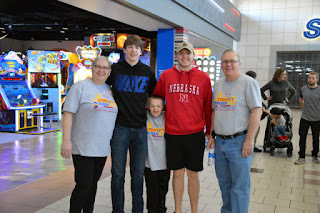 We were so fortunate to be able to attend the Lucky Few Buddy Walk, hosted by DSAA NE Kearney. The event was held at the old Kearney High School which is now First Baptist Church. It was a wonderful place for the event and the gym was spacious enough to hold everyone comfortably. We enjoyed the music, photo booth, cotton candy, and yummy food. Ben enjoyed the gluten free pizza that we picked up from Flippin Sweet on the way there. It was fun to go to an event and be able to enjoy the party! Thank you Suzanne, Kiffany, Beth and Lindsay. 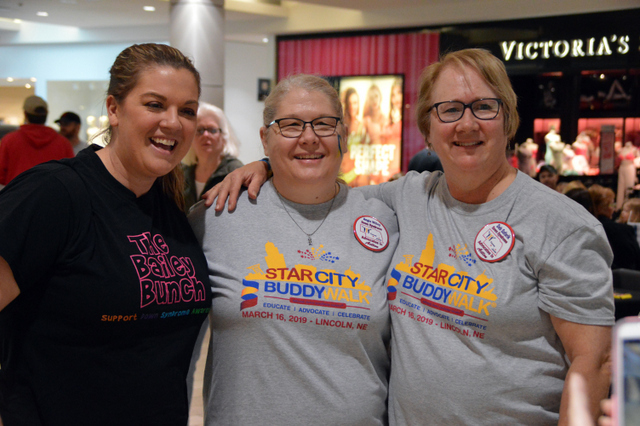 Lincoln Star City Buddy Walk! Thank you to Down Syndrome Advocates in Action for supporting all families who have a loved one with Down syndrome in Nebraska. Thank you also to all the wonderful volunteers for helping make the event such a success. This is the first year I got to actually walk at the walk and was thankful to have volunteer photographers to help us capture the day. Each year the Buddy Walk has doubled in size and we are grateful for everyone who comes out to support the local Down syndrome community so that we can make sure there are no families left behind. Thank you also to Shauna and Deb for helping to make this event possible! 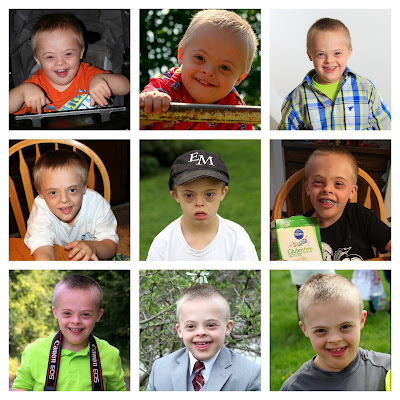 Every individual with Down syndrome deserves to be celebrated and everyone is welcome at DSAA NE! Thank you to all our friends and family who helped Ben's Brigade earn 3rd place in fundraising! Thank you also to everyone who purchased necklaces, earring, or EM Sports photos. Ben was so proud of the medal he received. This year has been a building year for the EM Basketball team with a new coach and losing a few players. Noah has been playing well and is doing OK with his move from playing the 1-2 position to playing the 4-5. That's what growing over 10 inches will do for you. The team has come up just short on a couple of games, that have been very exciting to watch. Every game they are making progress and we can see Noah's confidence growing. Here are the write ups from a couple of recent games. Inclusion, We Have a Long Way To Go. Yesterday we wrapped up inclusive schools week. I used to do much more to celebrate this week in past years because I thought true inclusion was happening in the schools around me. However, as I continue to study IEP’s to help my son and other families in the community, I realize that true inclusion is not a reality for most students with Down syndrome in my state. Yes, kids with Down syndrome are being educated in their neighborhood schools. They are often welcomed at lunch, recess, and they may even be included in a music or PE class or art class. But in reality, getting them into general education typical classrooms is a struggle. Before we go further, let describe what good inclusion looks like. Good inclusion is where kids with learning disabilities are taught along with their typically developing peers in a general education classroom, doing work modified to their current level of education with or without a para educator to assist them. This model of inclusion can and does happen every day in classes from preschool to post-secondary educational settings across the country. Not only does every study show that most kids with learning disabilities, achieve greater success from learning in in inclusive environment with support, these same studies show that typically developing peers do better in classes that include children with learning disabilities. So why isn’t every classroom in the state an inclusive classroom? There are many reasons. First off it is indeed more work for the teacher. Think back to the days of one room schools where kids of all ages and abilities were taught together. Modern teachers are not used to or prepared to do a lot of differentiated teaching. Secondly, since there are a handful of students that do learn better in a quieter setting with more one on one teaching, and the school had to put in the time and expense to set that model up for one student, why not just used it for all the student with learning disabilities. But in my opinion one of the most common reasons that inclusion is not practiced more is that because schools “tried it” and it did not work. Often that means putting a kids in a typical classroom with little to no support and expecting them to know how to behave and keep up. The term I use for this is bad inclusion, and it happens all too often. Yesterday I saw the movie “Wonder”. In this movie a boy with a physical disability was included in a typical 5th grade classroom and was finally accepted by his peers. I think the overall theme of the movie is to show the growth in those around the main character Auggie. His presence in school was not easy for him but it brought out the best in some of the people around him. But Auggie did not have a learning disability, in fact he was far above his peers academically. Do those same opportunities for growth occur when kids are tucked away in special needs classrooms? I don’t think so. Last night at the end of my son’s JV basketball game there was a nice moment that many will feel was possible because of inclusion. The other team had a young man with Down syndrome on the team. 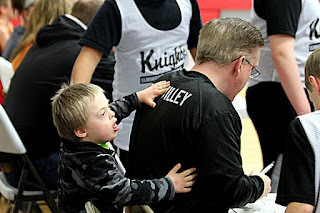 With a few seconds left, the other couch called a time out, put in the young man with Down syndrome and drew up a play to get him a 3 point shot. My middle son who was playing saw what was happening and told his team mates that no one was to block that shot and made sure he was guarding the young man. The shot went up but missed by a fraction of an inch. The crowd let out a collective sigh, but then one of our guys tipped the ball back to the young man. He put up another shot that went in just as the buzzer went off and everyone in the gym cheered. It was a special moment for this young man and a feel good moment for the fans. But was it made possible because of inclusion? I think it was, but it does show just how far we to go. You see true inclusion will happen when nice moments like this become the norm. When it is not a big deal to put a kid with Down syndrome in the game, or include them in a typical classroom with support, or have them participate in Holiday program without the teacher calling to say, don’t expect much from your child tonight. True inclusion means accepting everyone as valuable members of the school. So while we wrap up inclusive schools week, I hope those teachers who are rocking inclusion were truly celebrated and encouraged to continue their efforts. I also hope that parents who feel that inclusion is the best and least restrictive learning environment for their child speak up, advocate and help make inclusion the norm. Mom guilt is a pretty rough thing. Today I am feeling it a bit more than normal. I'm feeling guilty because we took Noah out for his Birthday lunch at a place that is supposed to be really good about having gluten free options and are careful about cross contamination. I listened to and trusted our server and as a result Ben ate gluten. I should have known to double check her and when I did and realized Ben had gotten gluten, I felt so bad for not checking first. It is not impacting him as much as it has other times, and he is doing pretty good over all, but I can tell he is in some pain. After a full day we finally got home, and I got to work a while on restoring my computer ( my hard drive failed and I lost 20% or my data and all my programs). The new photo software program has a face recognition feature, and I noticed a trend on the pictures of Ben. Up until he started Kindergarten, he was chubby and bright eyed for the most part. But then the weight loss and behaviors started to happen. I knew at the time there was something going on with Ben, and I just could not put my finger on what it was. In addition to losing weight, his eyes often had those dark circles under them. The doctor called it allergies and did not think we needed to be concerned about the weight loss, but I wouldn’t let it go. We finally got him tested for Celiac Disease and that was it. Looking at this collage the progression of the disease is pretty easy to see. Ben went from a happy, chubby little boy, to a sometimes happy, sometimes crabby little boy who looked sick, and is now heading back to being a chubby little boy as he has gained 10 pounds in the last 6 months. The photo in the center is the one that caught my eye the most and made me realize how bad he must have felt while is little body was not absorbing nutrients. More Mom guilt. I should have caught it earlier. I am taking photos of him all the time. Why wasn’t I comparing them to past photos? The first row of the collage above shows him as what appears to be a healthy 3-5 year old. The third row shows him on the road to recovery, age 8 to present, and able to gain weight and take in nutrients again. Thanks to the new photo software, I should be able to compare photos and plan to do so from here on out. But there is still mom guilt…….. 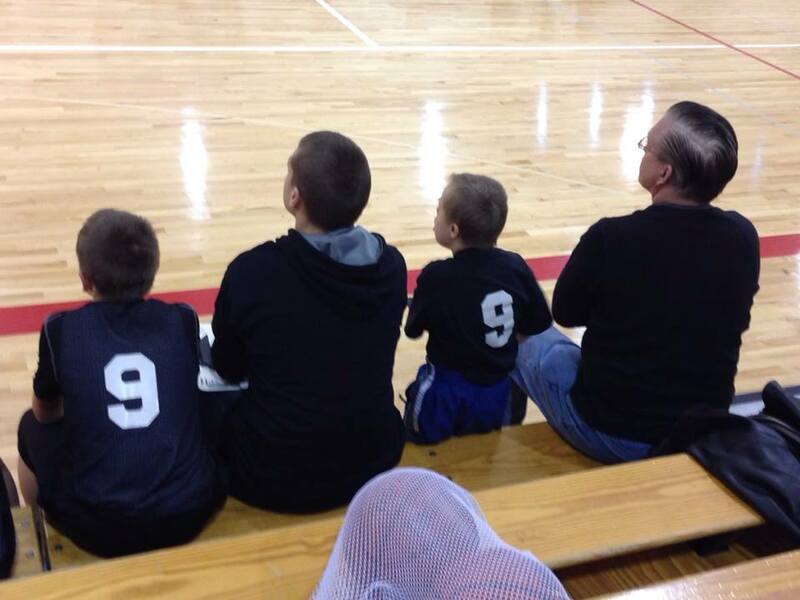 I should have known that basketball would be in his blood. You see he was supposed to make his entrance into the world on April 6, 2008. It was all scheduled and everything, but instead my water broke about 5 am on March 20th and the c-section needed to be moved up quickly. Looking back now, I know why it happened. Thursday March 20th was the first day of the NCAA Basketball tournament that year, and Ben apparently did not want to miss out on any of the basketball games. He was just hours old when he got to "watch" his first game. I do vividly remember, how great it was, when all the visitors and family left so I could finally turn the channel to something other than basketball. 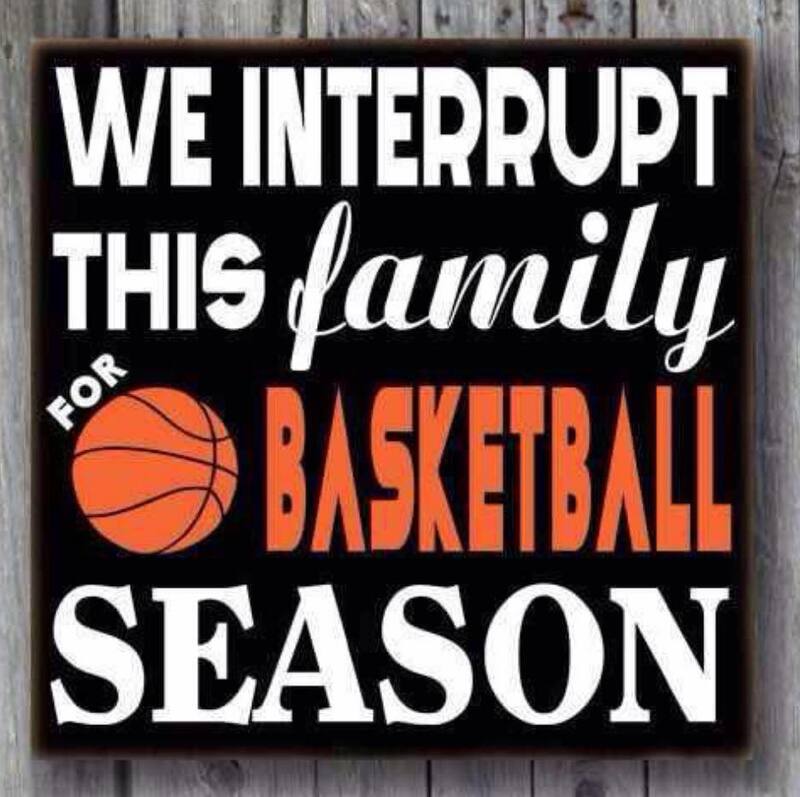 We have had a boy (or 2) playing basketball in our family for the last 9 years. So Ben has literally grown up with it. When he was smaller, and Randy was coaching, he would occasional y "warm up" with the team. His favorite place was always right in the middle of things. He has been to his fair share of games in his life. But he has been watching and he learned quite a few things from watching players on the court. Plus he loves to shoot. There are 4 hoops in our basement. If he is down there, he shoots. If he is outside, he shoots. He loves going to his brother's games, But if he can find a ball, he will sneak out of their games and go to the other gym, and if it is empty, he shoots. You get the picture. The boy loves basketball. About a month ago, it was sign up time for 3rd grade boys basketball team. 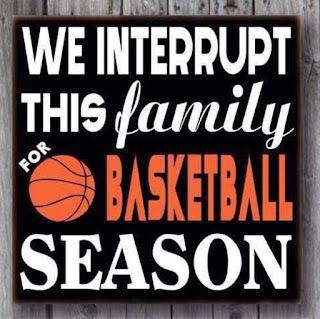 I discussed it with Randy and with both of the older boys playing high school ball, we were busy enough. While Ben shoots, dribbles, and plays defense pretty good, he does not get things like double dribbles, traveling, plays, fouls, the out of bound line or playing by the rules. Would it be fair to the other kids to have him go out? Would we have the strength to deal with one more practice and game schedule? Having Ben on the team requires one of us to be involved on the team too. We just weren't sure we were up for it. So the deadline came and went and we let it. I happened to be at school during the first 3rd grade practice and saw them running drills. I had a touch of remorse. Ben could do drills. It would be great exercise for him. We are always looking for ways for him to interact with his peers. Maybe we should have signed him up? But since the deadline had passed, I let it go. The next week at the high school game I ran into Coach Dan (who is also their awesome baseball coach). He asked if Ben would like to play on the basketball team. I told him what Randy and I had discussed and that we just were not sure how he would do, or if we were up for it. He said he needed a couple more guys so they would have 10 total and make it easier to scrimmage, and it would be fine if we just wanted to try it to see how Ben did. So we went to practice. The boys were shooting when we got there and Ben jumped right in. This might not be so bad, I thought. But then it was time to stretch. Ben would not participate. He wanted to continue to shoot and play in the gym and wanted no part of the organized practice. For the next 10 minutes he laid on the floor and cried. I have to admit, I was actively trying to get him out to the car for that 10 minutes that seemed like an hour, and if I had been successful we would have let the door slam and would not try to go back. Then something amazing happened. They started to do drills. Drills that were somewhat similar to the drills he used to do with Noah's team, Ben got up, and started to participate. He started to do so well I went up to talk with some of the other Moms for a while. Did he do perfect? No. But was it a solid start? Yes. He was doing something he knew. Something he had already been doing for the last 4 years. Each practice seemed to get a little bit better. He seems to listen pretty good when Coach Dan and Don speak directly to him (not so much when they address the whole team). But he is learning to try new things. 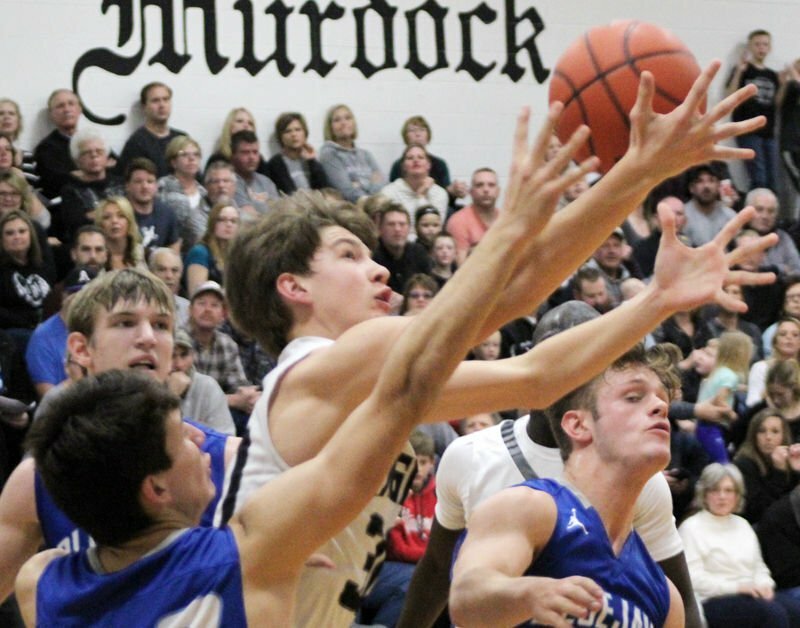 I have seen him try to dribble under his leg (which is hilarious), try to dribble 2 balls to half court, and give up during a scrimmage and start doing the same warm-up stretches the high school does across the gym floor (also hilarious). The best part of all is that he is having fun! This weekend the Knights played their first official games. They played one on Saturday and 3 on Sunday. We did not think he would be able to do all 3 games on Sunday, but he did! He played a few minutes in every game. During the second game on Sunday, he actually got a rebound and took it all the way down the court and scored. He was so proud and so were we. 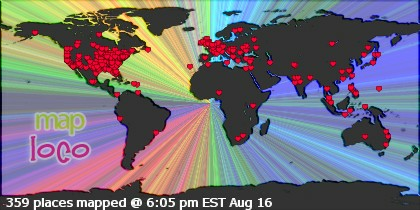 Amazingly, I happened to be filming right then and caught it on video. Here is his shot and a couple other clips of him in action. It should not be hard to pick him out, but he is number 10 wearing white. I talk inclusion all the time, but I admit, it is hard work. Some days I am just not up to it. But I am so thankful to people like Coach Dan who gave me the nudge I needed to make sure Ben got to play this year. Basketball is his favorite sport after all. It is in his blood. Urban Craft Camp Calligraphy Workshop! Having Fun At Home With Master Dillon!